Our next Kitsap PFLAG meeting is Monday, September 21 at 6:30 p.m.
We will be discussing our experiences with schools and resources which can help LGBTQ youth navigate the new school year. 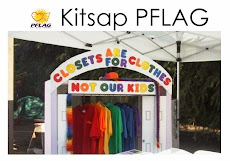 Kitsap PFLAG meetings are open parents, friends, families, and allies of the local LGBTQ community. We are meeting at the Family of God Lutheran Church at the corner of Central Valley Road and Fairgrounds Road in East Bremerton.